Product #16863 | SKU V2ANALOG | 0.0 (no ratings yet) Thanks for your rating! 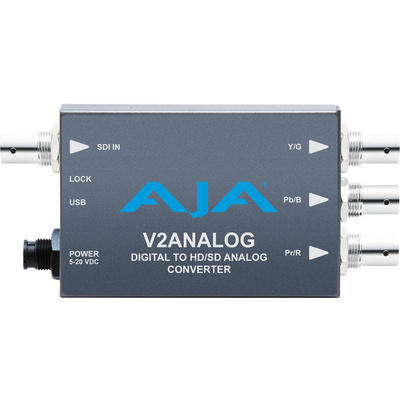 The V2Analog HD/SD-SDI to Analogue Mini-Convertor from AJA provides SDI digital to component/composite analogue conversion at either HD or SD resolutions. It is ideal for integrating analogue equipment such as monitors and tape decks into digital workflows. It utilises a full 10-bit data path to ensure a high-quality conversion. Its low power consumption and compact size, makes it suitable for use on set or in AV installations integrating different signal types. The V2Analog supports NTSC, PAL, 720p at 50/59.94/60 Hz, 1080i at 50/59.94/60 Hz, and 1080psf at 23.98/24/25 Hz. The convertor accepts incoming digital SDI signals and converts them to analogue YPbPr (SMPTE, EBU-N10), Betacam, or RGB component outputs, and NTSC/PAL or S-Video composite outputs. It is important to note that the V2Analog does not up-convert or down-convert between SD and HD resolution. Only digital to analogue signal conversion is performed, therefore an HD-SDI signal will be output as an HD analogue signal and won't be compatible with devices that only accept SD analogue signals. Configuration can be set on the unit itself using the DIP switches, or remotely with AJA's free MiniConfig software for Mac or PC over a USB 2.0 connection. The software provides an easy-to-use graphical interface with detailed information about input and output formats as well as all configuration parameters. A universal 5 VDC power supply comes included. Please note: V2Analog does NOT up-convert or down-convert between SD and HD resolutions. Only digital to analogue signal conversion is supported.